Plan your future. Achieve your dreams. You have access to a career counselor, a career identity coach and many other resources to help you succeed. NC State’s Career Development Center offers a wide array of resources to help College of Humanities and Social Sciences students plan for life after college. 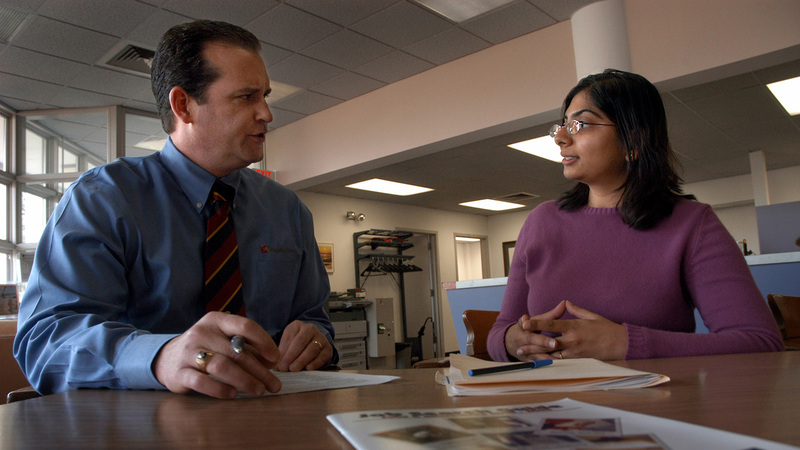 With dedicated career services professionals assigned to our college, you can receive one-on-one support and guidance to achieve your professional goals. Schedule a 30- or 60-minute appointment on ePACK to meet with your career counselor or coach. These professionals can help you explore majors and careers, write or polish your résumé/CV or cover letter, find an internship or job, prepare for graduate school or participate in a mock interview. The Career Development Center also offers daily drop-in hours where you can see an on-call career counselor for a 15-minute meeting. Hours are Monday – Friday 11 a.m. to 2 p.m. during the fall and spring semesters, when classes are in session. No appointment needed. Find the perfect major or career: Apply to join the Career Identity Program. This exclusive year-long program will guide you through exploring your values, interests, skills and personality while connecting you with resources and educating you through activity based workshops. Earn a certificate to bolster your résumé while answering the age-old question of “What/who do you want to be when you grow up?” For more information, contact Courtney Jones. Get prepared for an internship or part/full-time job: View the Career Guide to learn about the skills employers seek, view sample résumés, common interview questions, information regarding how to create an engaging LinkedIn and more. Participate in LAUNCH professional development workshops to learn from your peers, our trained and experienced Career Ambassadors: Workshops cover a variety of career-related topics, and are only 50 minutes long. If you attend six sessions, you’ll earn a professional LAUNCH certificate. Interested in becoming a Career Ambassador? View more information on the NC State Career Development Center website. Ready to begin building your professional wardrobe? Visit the Wolfpack Professional Clothing Closet. We have gently used, free professional clothing you can try on and take home to keep. Check out our Wolfpack Styled Professional Clothing Closet for free dress clothes that you can keep and wear to interviews, career fairs and more. Search for internships and job opportunities on ePACK using the “advanced search” feature. New opportunities are added daily during the academic year. Some opportunities are paid. Consider enrolling in an internship course, and receive academic credit for your experiences. Here’s another great way to save time and find employment opportunities related to your career interests: use industry or major-specific job boards. Want to find job boards related to your major? Open and print out any of the lists at the links below. “I knew what career I wanted to pursue when I started the Career Identity Program, but I didn't have a clue how to begin preparing for it. Courtney, my Career Development Center counselor, taught me the importance of reaching out to people in my field and asking them for advice, which has made me more confident in my networking skills." This career fair will be held on Friday, Feb. 8, 2019, in Talley Student Union. Begin building your network of professional contacts or find your first internship or job. Freshman- to graduate-level students of all majors are invited to participate. Make plans to attend this fair as well as other career fairs on campus throughout the year. View the full list of career fairs on the NC State Career Development Center website or on ePACK in the “Events” tab. Held from 10 a.m. - 4 p.m. in Caldwell Lounge on Monday prior to the career fair. Stop by for a drop-in meeting with a career counselor. Get your résumé/CV reviewed and gather resources regarding professional dress, conversation starters and tips about how to follow up with an employer after a career fair or networking event. Bring printed copies of your materials for review.